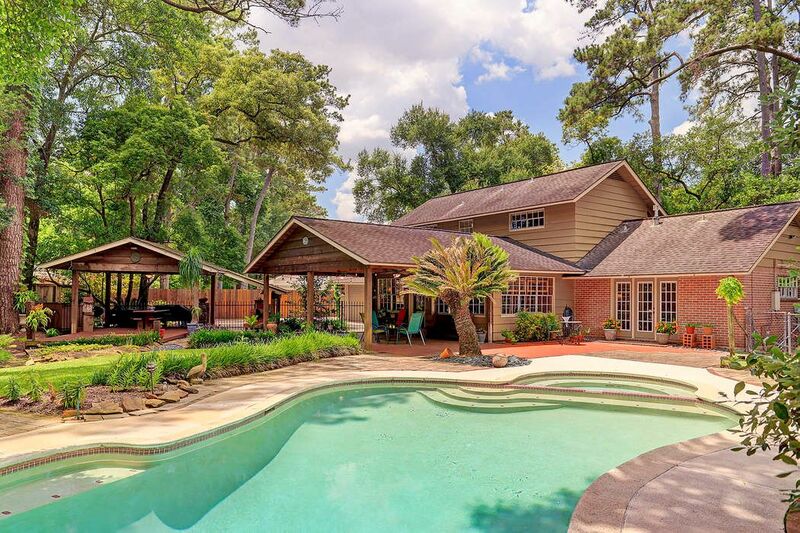 11603 Woodsage Drive, Houston, TX 77024 | Martha Turner Sotheby's International Realty, Inc. 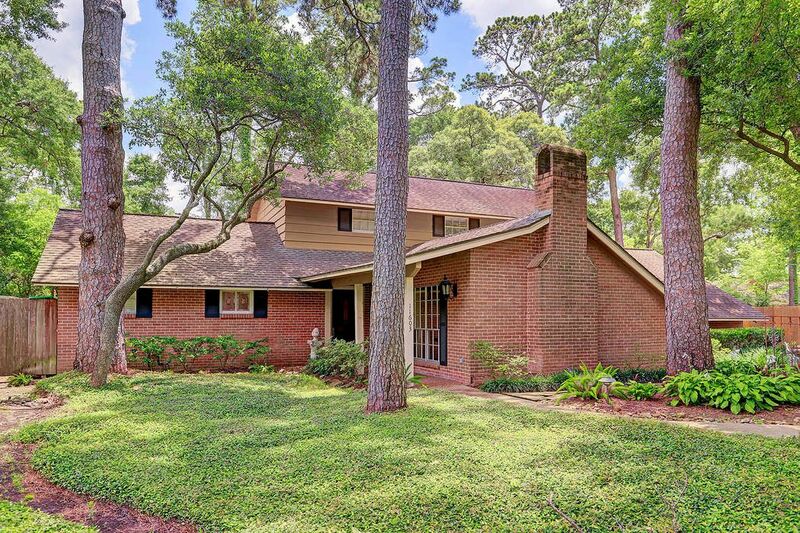 Welcome to 11603 Woodsage Drive! 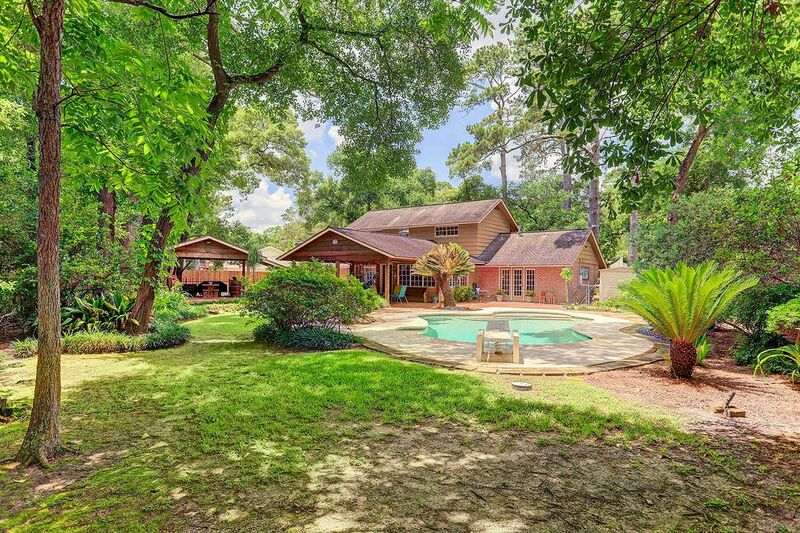 17,500 sqft lot located on a no-outlet cul-de-sac. 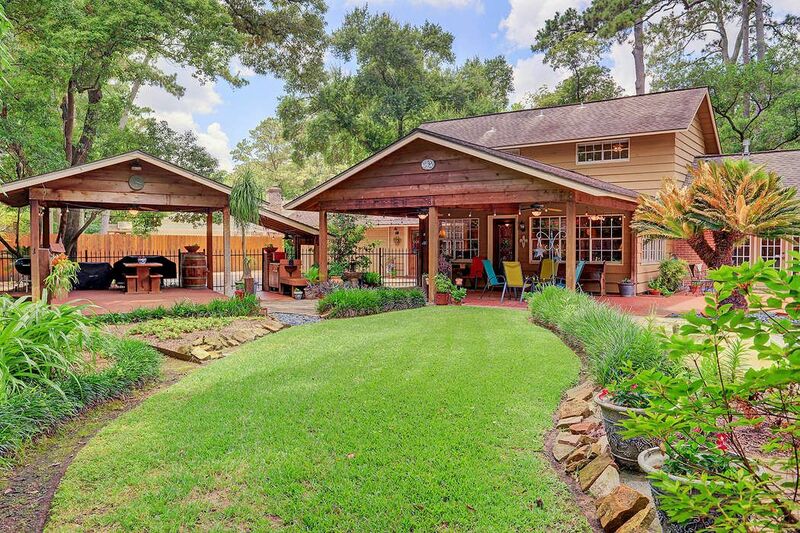 Beautifully landscaped yard with mosquito misting system. Well-appointed and manicured exterior elevation. 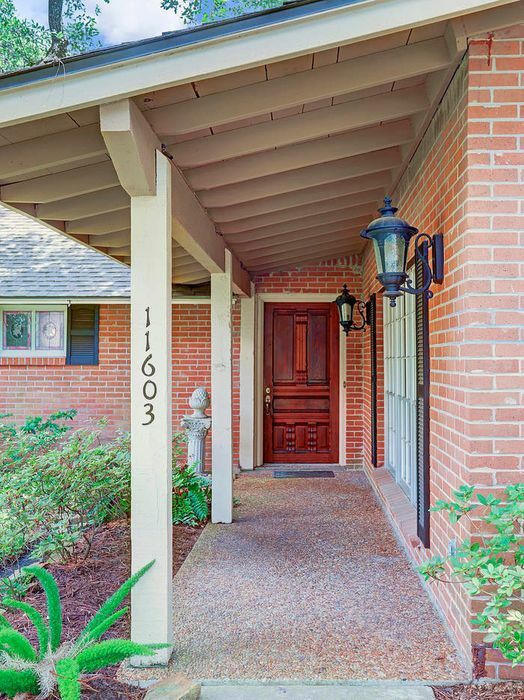 Charming curb appeal! Front entrance is slightly shielded and offers privacy. Tongue and Groove pine lines the stairwell. 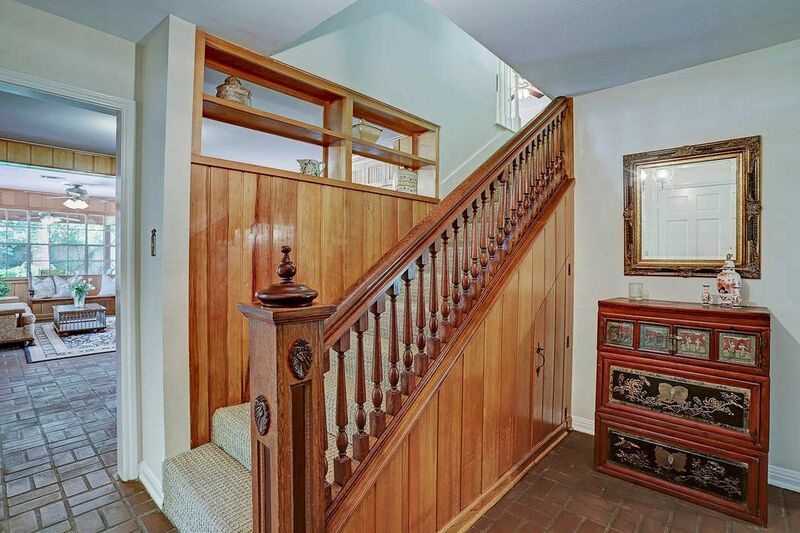 Notice the charming storage closet under the stairs! 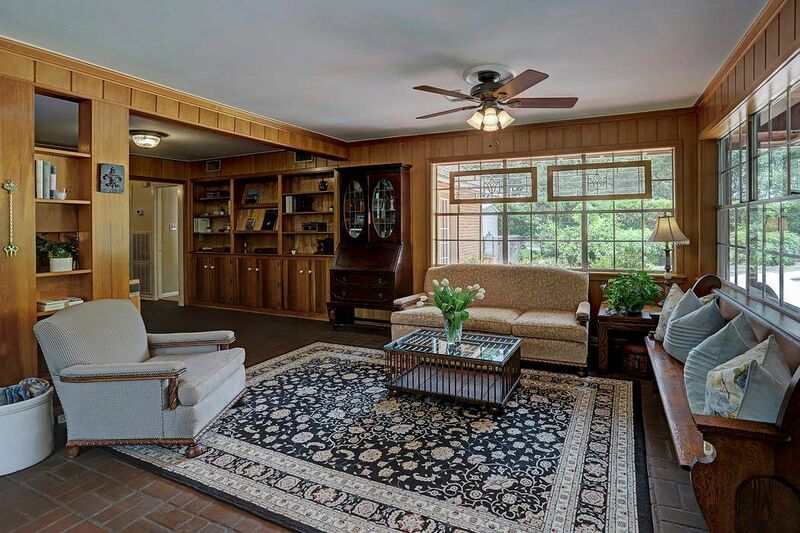 Bright and open family room! Tongue and groove pine can be painted for a modern farmhouse look. 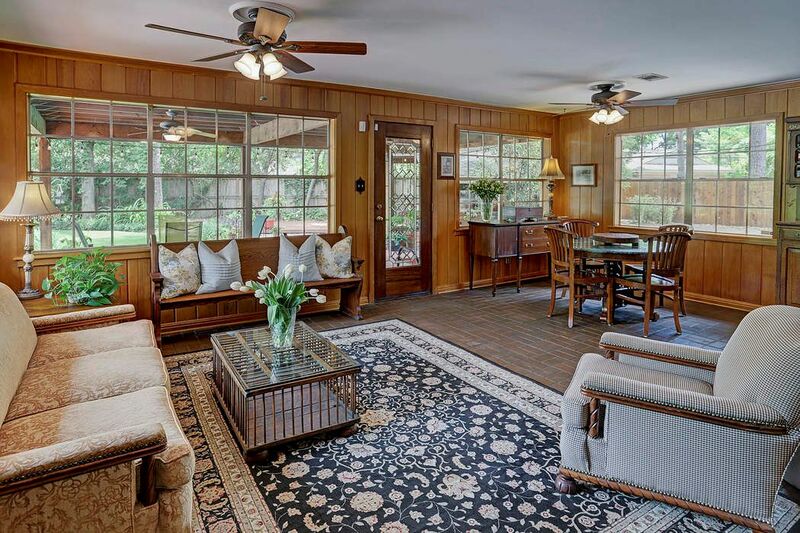 Plenty of natural light in this family room, which opens to a beautiful covered deck. View of family room, looking toward the pool. 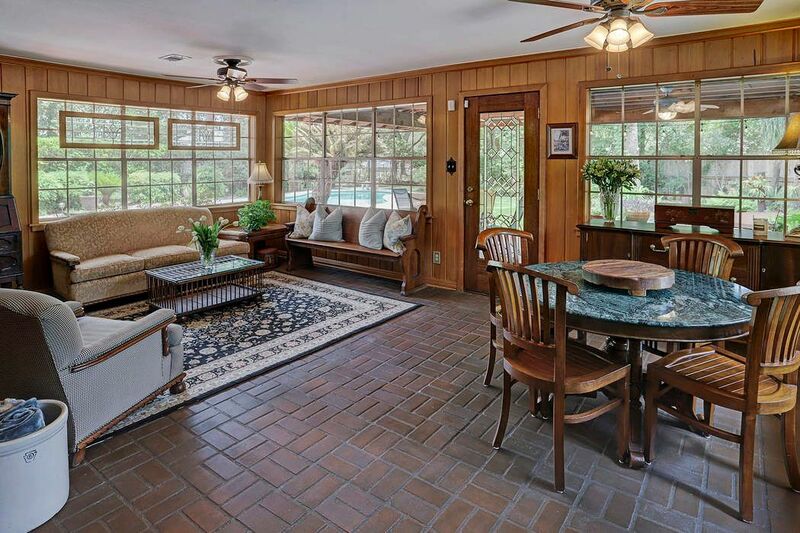 Brick flooring is very durable and provides an authentic cottage feel. Family room, looking toward the Master bedroom hallway. Family room, looking toward the kitchen and den. Attached garage is visible. 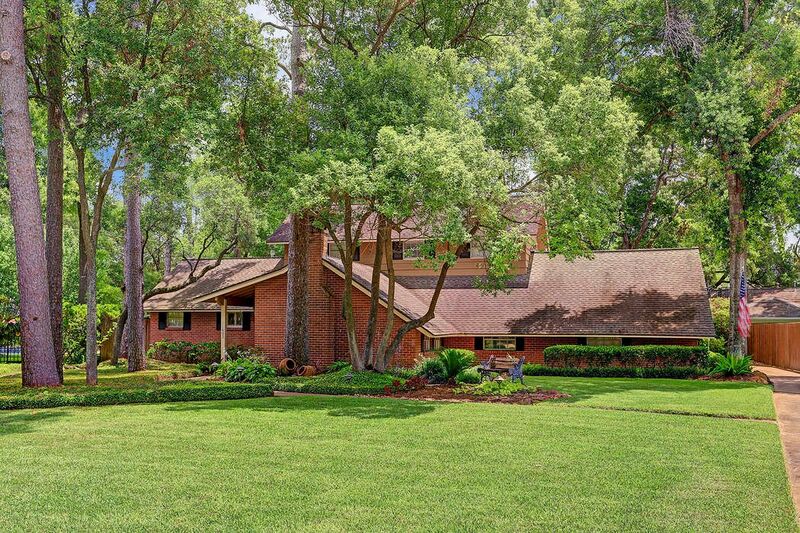 Driveway wraps around the back of the home and provides an extremely spacious paved area. 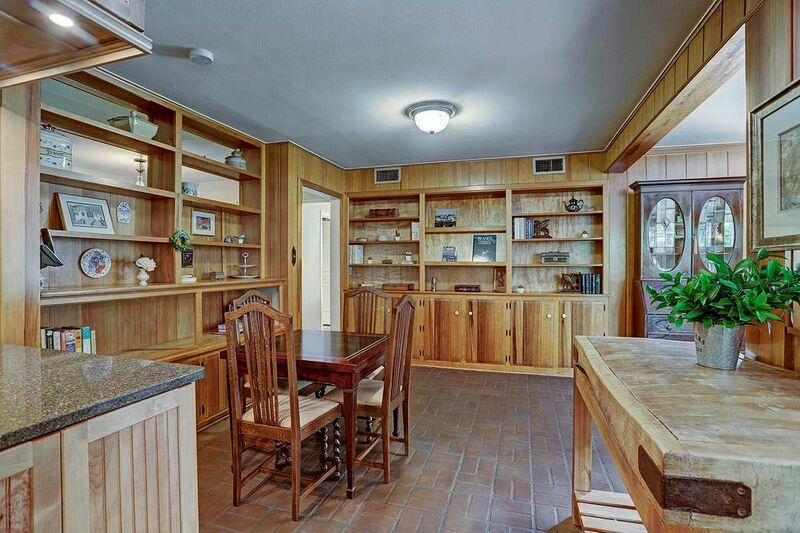 Cozy breakfast nook with abundant shelving and storage. Kitchen and den with a peek into the dining room. 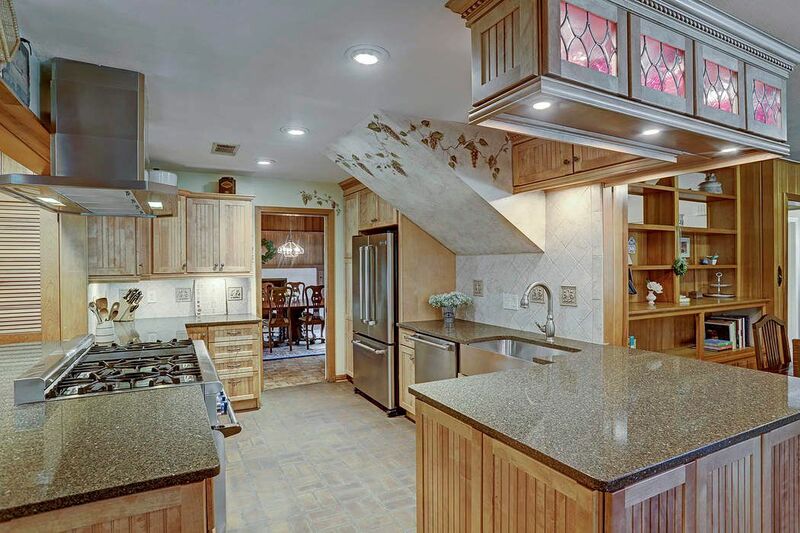 Plenty of storage and counter space! 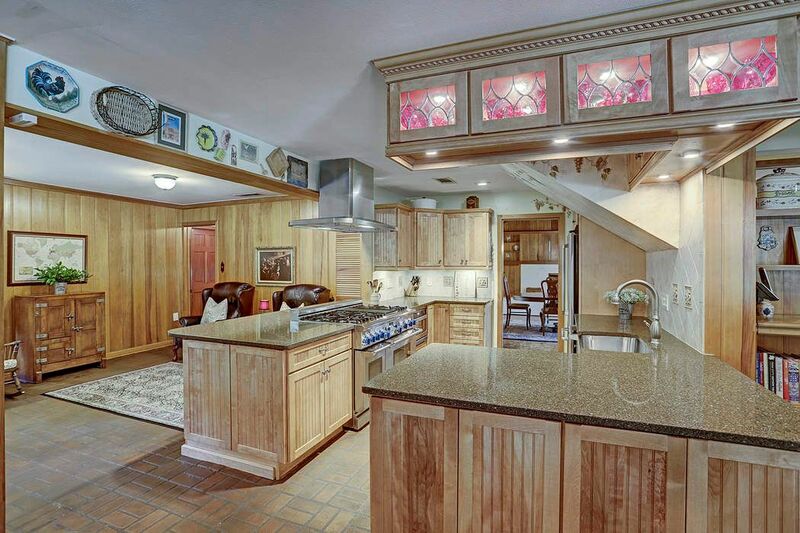 Upgraded kitchen with stainless steel farmhouse sink and top-of-the-line SS appliances, which remain. 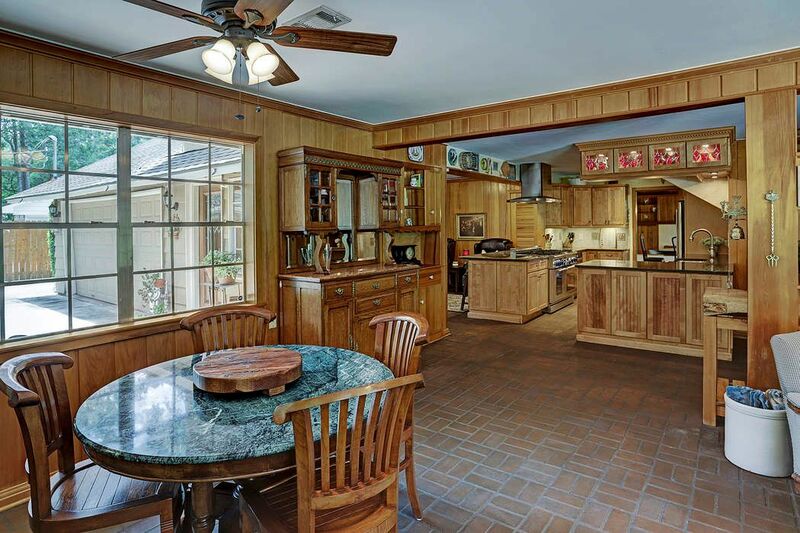 View of kitchen, looking toward den & family room. Exceptional Thermador gas range! Microwave has a pull out drawer. Den, looking toward kitchen and family room. 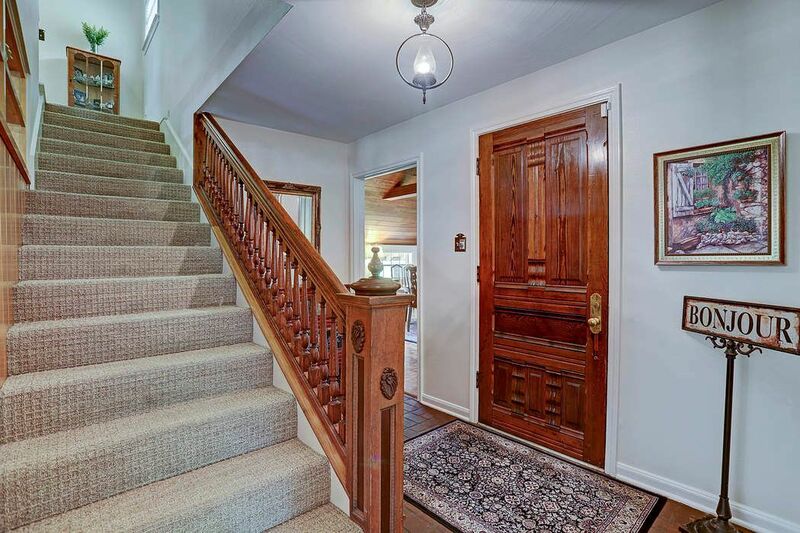 Glass door opens to rear driveway, which is very spacious! 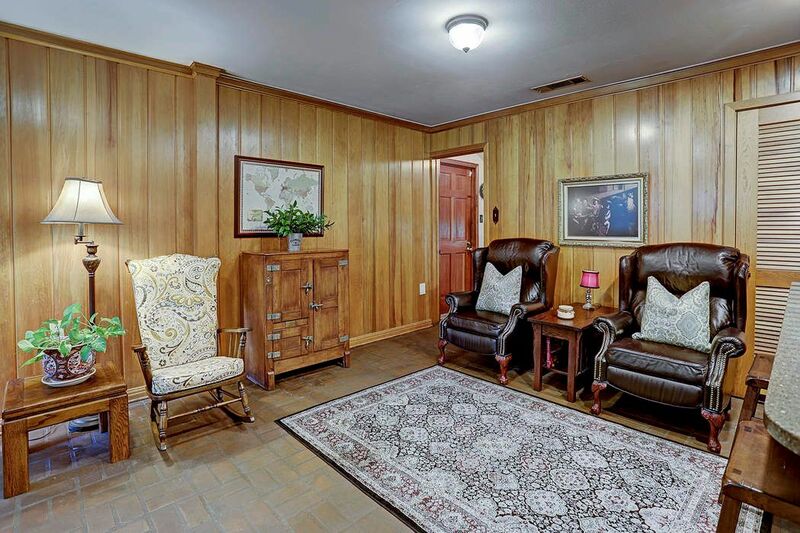 Cozy den with brick flooring and tongue and groove pine. Mud room and garage entrance through left doorway. 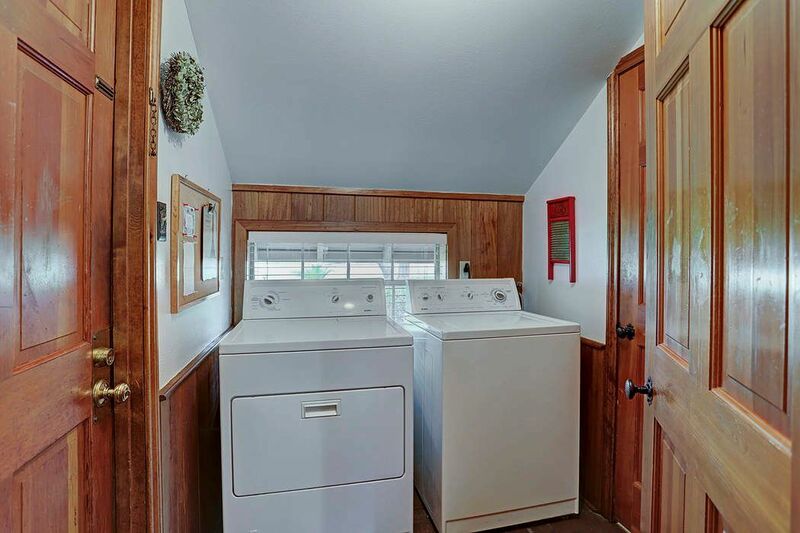 Laundry room with storage closet. Left door opens to attached garage. 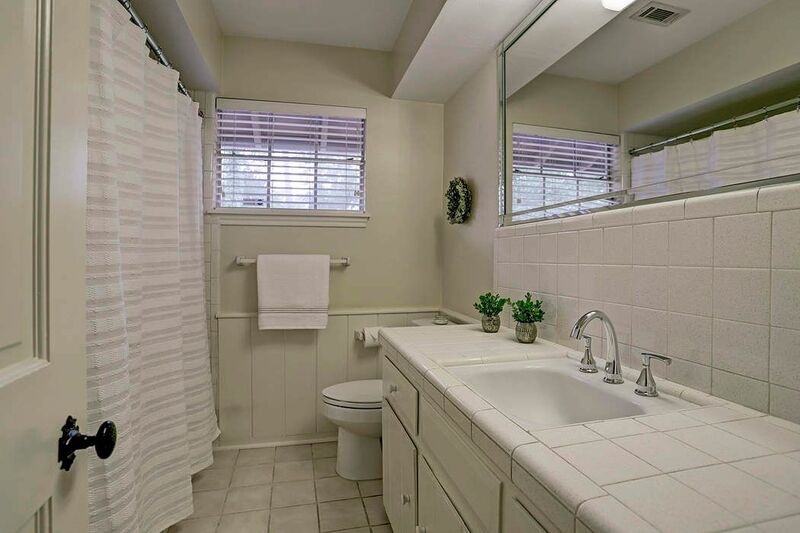 Right door opens to half bath. Washer/Dryer remain. 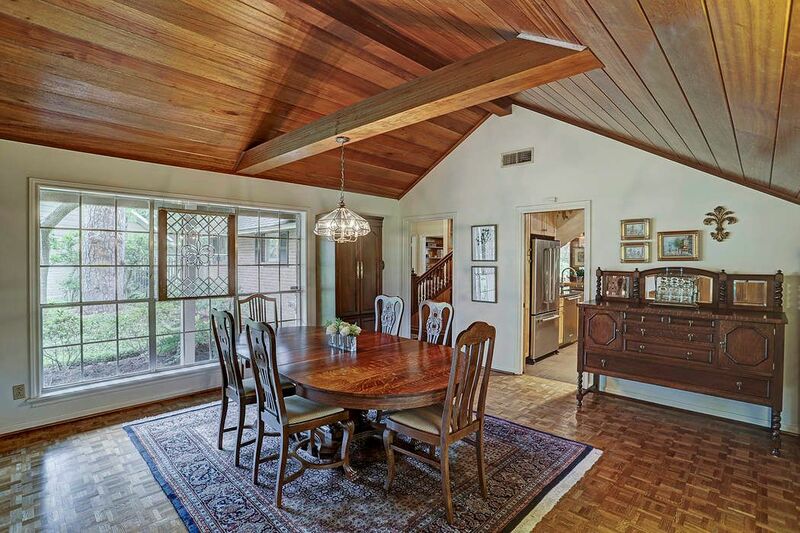 Very large dining room with vaulted ceiling and mahogany tongue and groove paneling. Gorgeous fireplace. What a lovely place to host holidays! 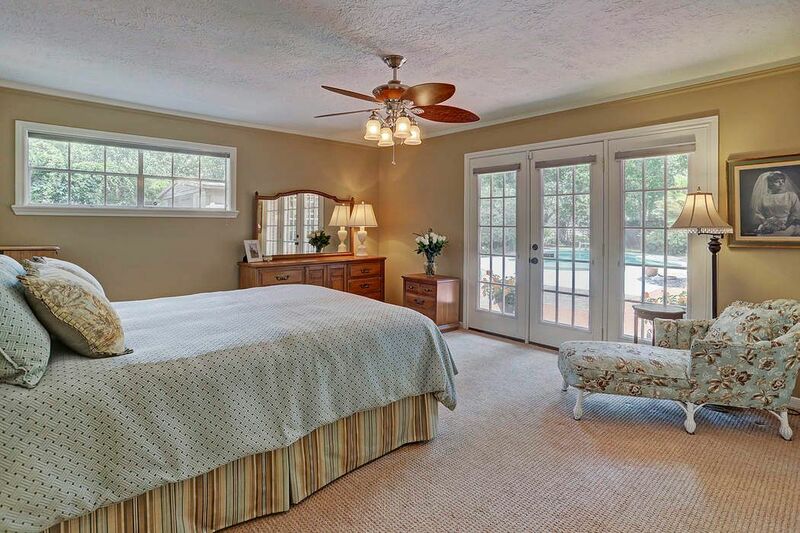 Dining room has top-of-the-line parquet floors and a gorgeous wood/gas capable fireplace. 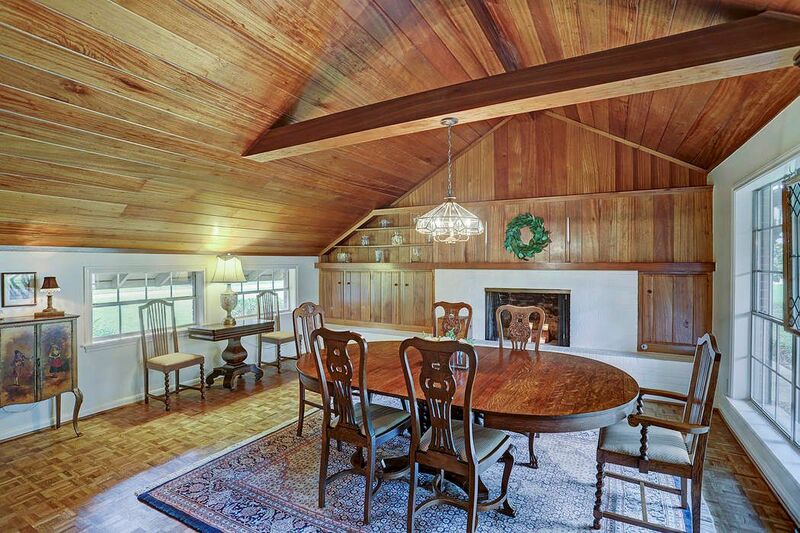 Ceiling and walls are tongue and groove mahogany. 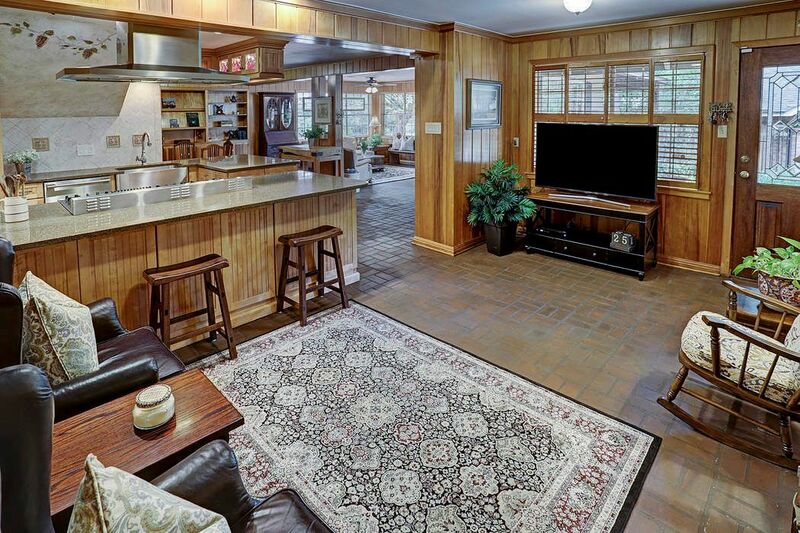 Quite a large space for entertaining. 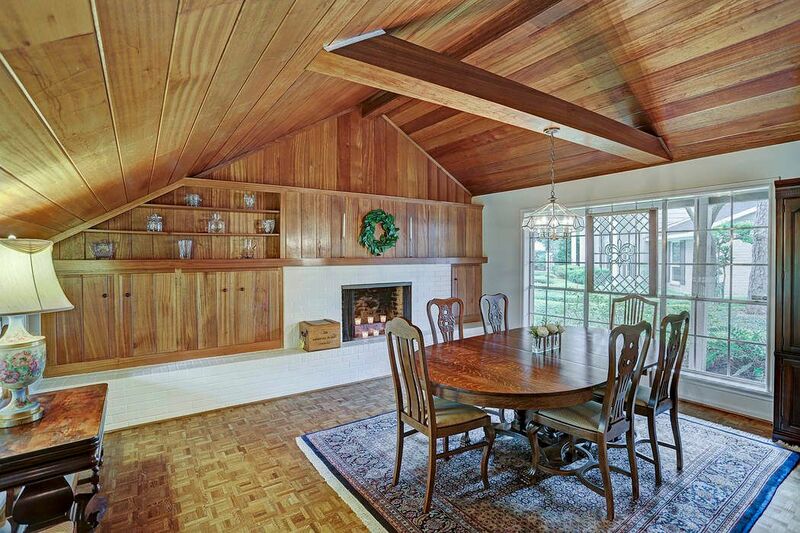 View of dining room, looking toward the kitchen and entryway. 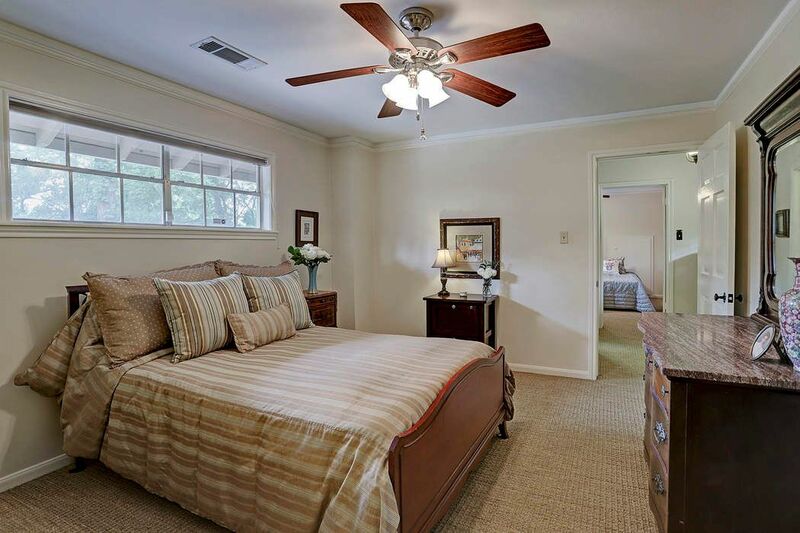 Lovely master bedroom with private entrance to pool and secluded patio area just outside the door. View of master, looking toward bathroom. Beautiful soft lighting in this room. 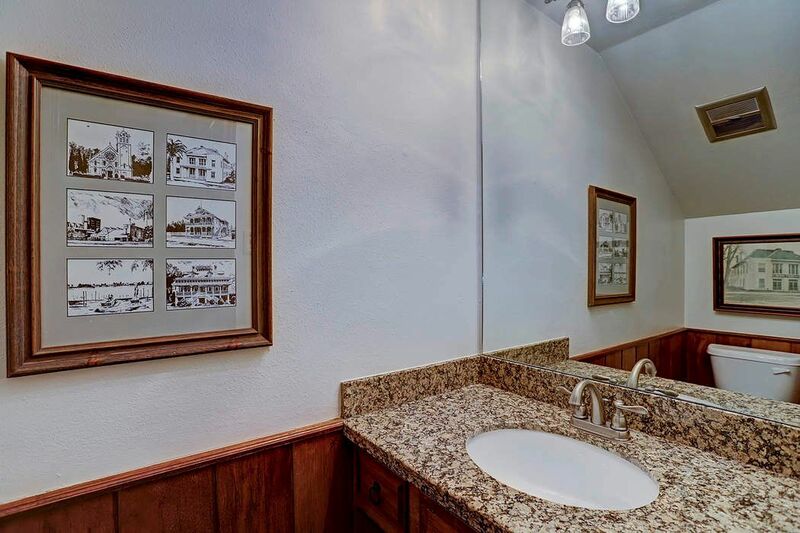 Master bathroom is updated with beaded cabinetry, granite counters, and travertine. 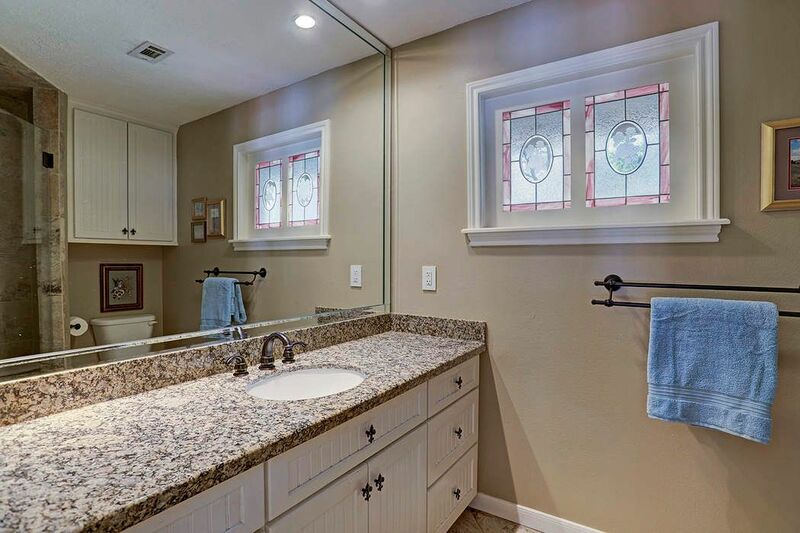 Attractive stained glass window provides privacy and balanced lighting. Master shower with weighted glass door and travertine tiles. Peek into lovely master. Bedroom 2, upstairs. Ample storage through floored attic crawl space. Upstairs bathroom, shared by bedrooms 2 and 3. Very clean condition. Bedroom 3, upstairs. Ample storage through floored attic crawl space. Covered deck #1, looking toward back driveway. Deck connects to family room and is perfect for entertaining. 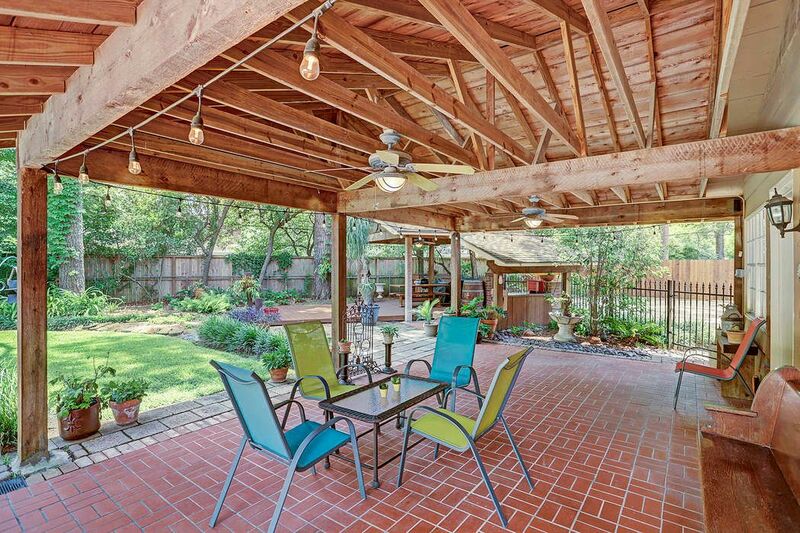 Fantastic covered deck with dual fans and mosquito mister for optimal comfort. 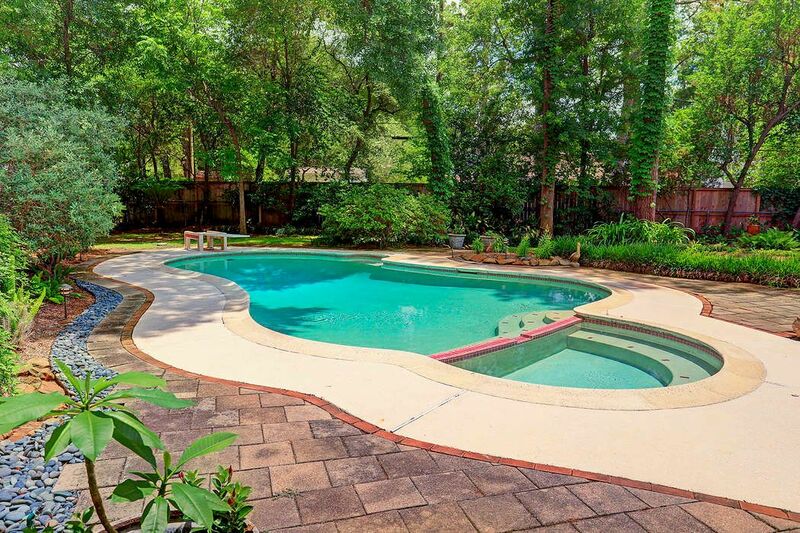 Private pool and plenty of green space in the expansive yard! Two covered decks. Mosquito mister system reaches entire outdoor area. 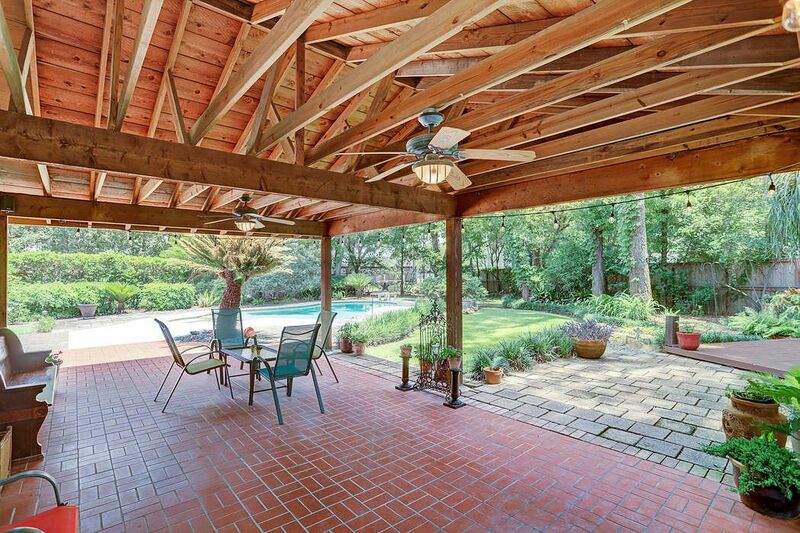 Lush backyard with plenty of space to garden, play, swim, grill, and relax! Side yard to the right (not pictured). Rear, exterior elevation on the backside of pool. Lovely and private yard. Trees surround, but do not shade pool too much. 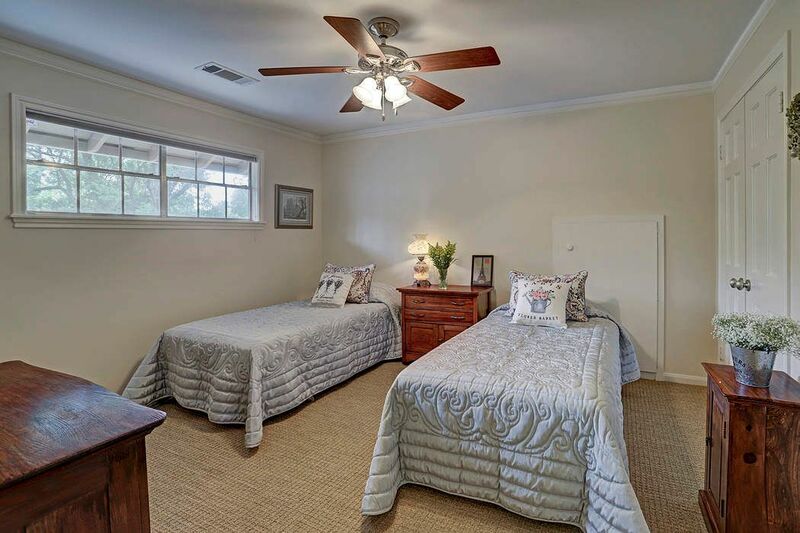 $977,000 3 Bedrooms2 Full / 1 Partial Baths2,784 sq. 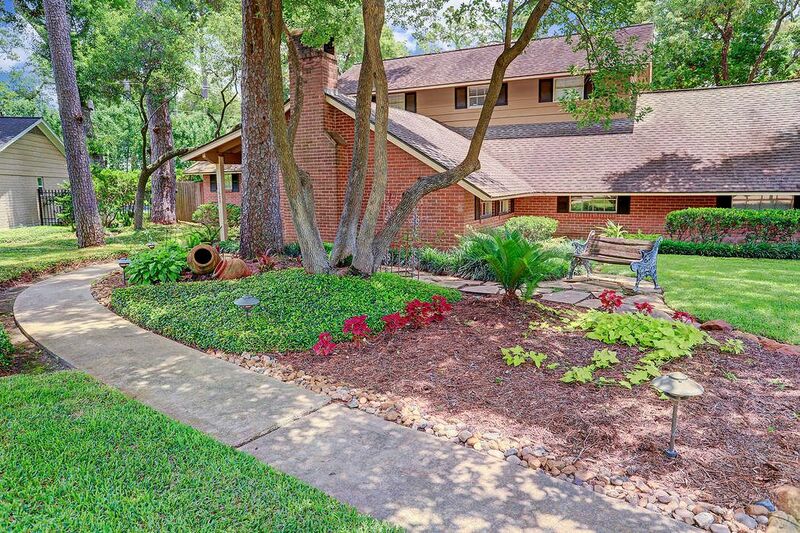 ft.
Delightful Hedwig Village cottage located on a cul-de-sac. Tastefully updated throughout, yet ample opportunity remains to add your own touches. Spacious approx. 17,500 sq. 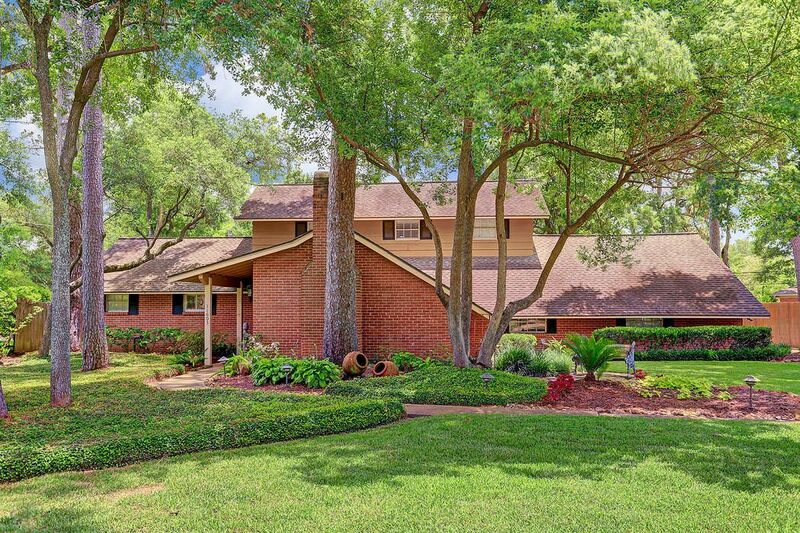 ft. corner lot with mature trees, lush landscaping and backyard with 2 decks, mosquito system, pool and green space. 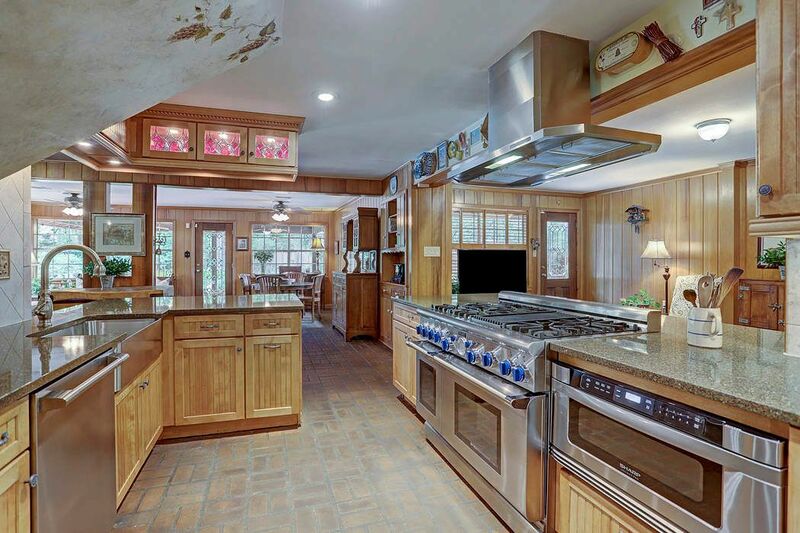 Inside, a timeless floor plan centers around the kitchen, which opens to all living/dining areas and has been modernized with high-end stainless steel appliances, beaded cabinetry, a farmhouse sink and fabulous gas range. 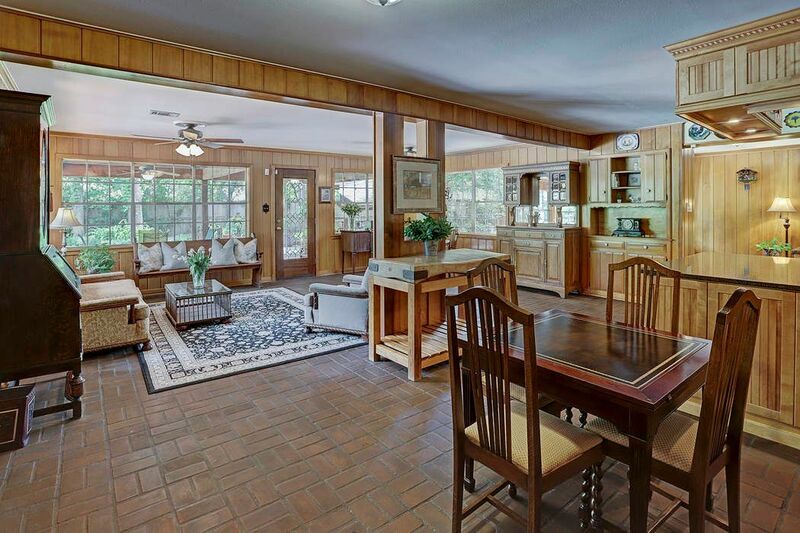 The master (downstairs) is filled with natural light and opens to the pool. 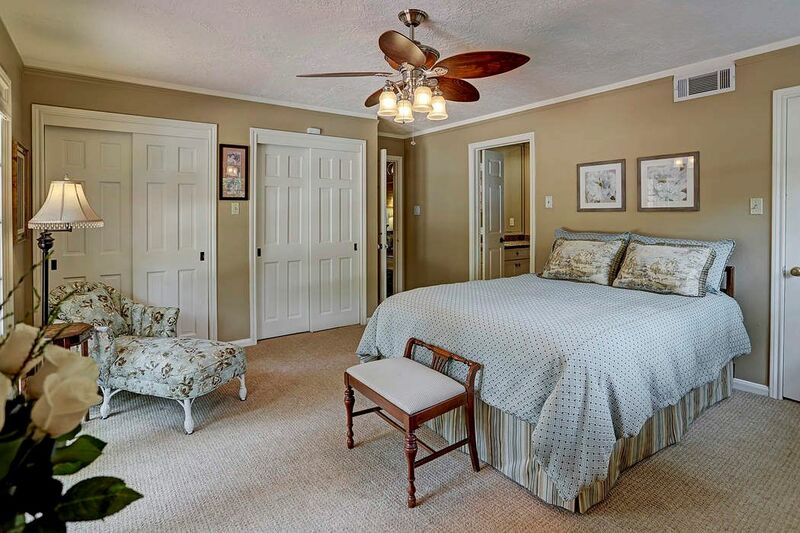 Upstairs, 2 generously-sized bedrooms share a bath. Zoned to exceptional schools with the opportunity to choose between middle schools (Spring Branch/Memorial Middle). Easy access to I-10. Convenient to Memorial City Mall. Did not flood.